There are several types of glaucoma. The two main types are open-angle and angle-closure. These are marked by an increase of intraocular pressure (IOP), or pressure inside the eye. Has symptoms and damage that are not noticed. 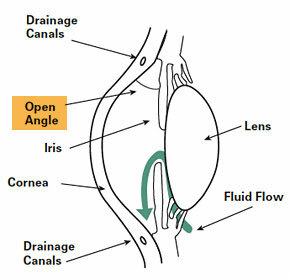 “Open-angle” means that the angle where the iris meets the cornea is as wide and open as it should be. Open-angle glaucoma is also called primary or chronic glaucoma. It is also called acute glaucoma or narrow-angle glaucoma. 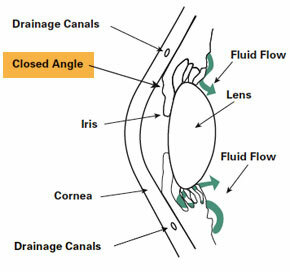 Unlike open-angle glaucoma, angle-closure glaucoma is a result of the angle between the iris and cornea closing. Also called low-tension or normal-pressure glaucoma. In normal-tension glaucoma the optic nerve is damaged even though the eye pressure is not very high. We still don't know why some people’s optic nerves are damaged even though they have almost normal pressure levels. This type of glaucoma occurs in babies when there is incorrect or incomplete development of the eye's drainage canals during the prenatal period. This is a rare condition that may be inherited. When uncomplicated, microsurgery can often correct the structural defects. Other cases are treated with medication and surgery. With inflammatory glaucoma the inflammation can either raise or lower the IOP (intraocular pressure). Inflammation causes white cells to form in the liquid in the front of the eye. The cells get trapped in the trabecular meshwork (the “drain”), blocking it. The fluid also becomes thicker and less likely to pass through the drain, and the trabecular beams that make up the drain swell, making the pores between them smaller. Inflammation can also release prostaglandins that increase the flow of fluid out of the eye between the muscle bundles of the eye. Traumatic glaucoma can occur when trauma injures the trabecular meshwork, the “drain” in the eye. Scarring ensues, and the drain works less well. Early on, blood and inflammatory material can also block the trabecular meshwork. Often there are signs of injury to the drain in the eye. One sign is called an angle recession. With this sign, the iris root is pulled posteriorly away from the trabecular meshwork. That is easily seen during gonioscopy. There is at least a 5% chance that someone with serious eye trauma and an angle recession will develop glaucoma later in life, even if the glaucoma is not present for several years after the trauma. Pigmentary glaucoma is a secondary glaucoma caused by an accumulation of pigment in the trabecular meshwork of the eye, blocking the outflow of fluid. Pigmentary glaucoma is usually found in near-sighted individuals in their late 20’s to early 40’s and is more common in males than in females. Iridocorneal Endothelial syndrome or ICE syndrome is a grouping of three closely linked conditions: iris nevus (or Cogan-Reese) syndrome; Chandler’s syndrome; and essential (progressive) iris atrophy, which together also spell the acronym ICE. ICE syndrome is caused by the diseased lining of the cornea, which grows over the drain in the eye, blocking it, and over the iris, causing stretching and a lack of blood supply.